What happens if 30 seconds isn't enough? Many artists get caught up in this idea that they need to produce a "sketch" in each 30 second window of time, and this becomes an impossible goal if in your mind a "sketch" is actually a semi-complete picture in pencil. Relax; you are doing just fine. Almost no one can actually get a "complete" drawing done in 30 seconds. That's actually the point — by giving yourself such a short window of time, you are forced to make cut-throat decisions about priorities, and stick to them. It demands that you prevent yourself from getting sucked into the "interesting" or "fun" details that leap out at you when you look at an image, and instead, absorb and capture the direction and energy of the complete figure as quickly as possible. If all you get in your 30 seconds is a single line that defines the flow of energy/the weight of the pose, that is a success. If you get a few "bubbles" down that define where the hips and torso are in relation to one another, that's perfect. You are doing gesture drawing like the masters. Before you begin your gesture drawing practice, take a deep breath. Remind yourself: You do not need to have something that is recognizable to another person at the end of those 30 seconds. You DO need to try and make a clear decision about what you see in that pose AS A WHOLE, and make one or more marks on your paper that record that decision. These are not drawings you’re going to put on the wall, these are exercises in perception that you do to "warm up" and put yourself in the right state of mind before you attempt those longer poses. There is no mistake more common for new artists than to get stuck in the "details" trap, to leap immediately to what is "fun" or "interesting" or what they think will make them "better" in the eyes of others, diving into shading or spending minutes or hours painstakingly rendering a particularly pretty set of eyes or hands only to discover when they're done that that beautiful detail is out of proportion with the rest of the body, or at a bizarre angle that disrupts the flow of the pose, or a hundred other mistakes that come from seeing the individual parts instead of the flow of the whole body. It takes a more seasoned eye to be able to resist working in detail and instead start with much more generality. Gesture drawing practice can help get you there. In class mode in our tools, the 30 second and 1 second series of poses that serve as a warmup, no matter what length of class you pick, are there to help you approach those longer poses with the same eye for seeing the whole first, for putting details in the context of a larger line and flow. My advice if you are worried that your 30 second drawings don’t look like anything: Stop worrying. Start putting a single line down that captures the direction of the spine. If you have time, bubble in the placement/angle of the hips, ribcage and head. If you have more time, add some lines for arms and legs. Don’t have time? No problem. You’re learning more than you realize. Comments on "What happens if 30 seconds isn't enough?" This is great advice. For a long time I've been worrying about not being able to have recognizable figure in 30 seconds. But now I realize its more about your perception of the figure and your decision making process than having something pretty. The 30 second poses are always super helpful to "loosen up" like you've stated. I find, to my sheer joy, that these short scribbles help me to complete the longer poses faster, which gives me time to get to all the fine details. I use to worry, thinking I was too slow, but have come to realized it's better to just do and let instinct take over. Thanks for the article! I just started my journey on gesture drawing (3 days ago), with the class mode. Of course I wasn't expecting results on this little time, but nevertheless I was getting frustrated with the 30 seconds poses. I'll try to relax and just enjoy the journey. Let's see if there is some improvement after a couple of months! I asked this question at the end of a tutorial...I should have looked here first. I was concerned that I wasn't getting much down in the 30 seconds...it always ends with me trying to decide where the dots go, but I understand the pint of it better now. Thanks so much! What a great site!! Muchas gracias por el articulo estoy muy contento con el sitio, si es un poco difícil, pero disfruto el echo de hacer trazos libres y rápidos y lograr un boceto en corto tiempo. I tend to linger 'cause I feel that the drawing is not completed it is missing something. Noticing that gestures were available as an option, and the premade "class"es was interested me so much about this site. I discovered the power of gesture drawing years ago and it's been priceless to re-programming the way I approach the figure. The results i my lines flow better and it's easier to *feel* the post of the character. Great site and wonderful article. Thank you. Great advice, gave me a new perspective, one thing tho, What should i be capturing in this 30 seconds? the line that goes thru the center of the pose? or maybe the edge that defines the dominant side? thanks in advance! 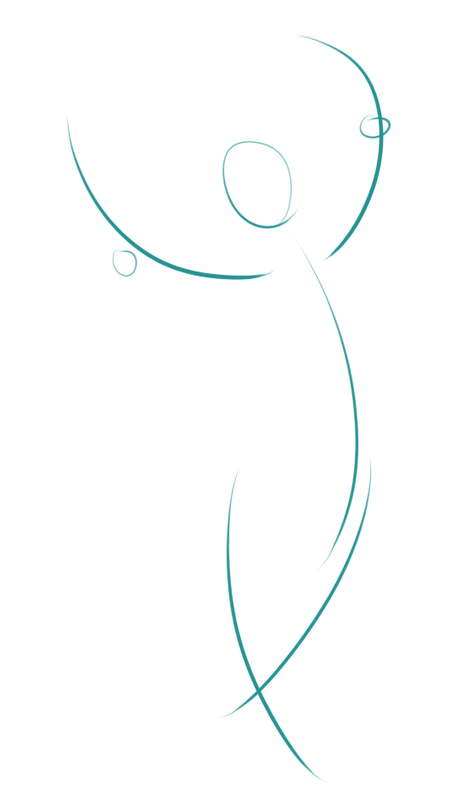 Even though this doesn't really look like a person, I spent 30 seconds capturing the most obvious motion lines of the body; at a first glance, it's not too hard to recognize this is a person with an arched back holding up their arms in a dance gesture. Being able to capture a pose and motion in just a few lines is the main goal of 30 seconds. I'm familiar with gesture drawing from years back. Still, it took a few days to get back into the "swing" of doing them. After that, I remembered why they're so important. Gesture drawing trains your eye to see the object all at once , and are really what set set up the conditions for more developed, good drawing. These are the exact words I wish I heard years back. Getting back in the game and I'm already doing much better by not worrying. Thanks for the speech!